With this fantastic new Crafters basket, you do not have to frantically look for your favourite notions or sewing accessories. Enjoy total peace of mind knowing that everything is always together and organized. 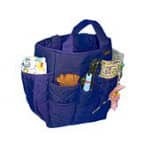 The Yazzii Craft Basket offers 14 external and 4 internal pockets and a generous base for large items. Size 28 x 23 cms. / 11 x 9.1 inches.